“If we were to immerse ourselves in everything that Agudas Yisroel stands for, we’d be better people!” This call to action, stated with feeling by HaRav Yaakov Perlow, Novominsker Rebbe and Rosh Agudas Yisroel, resonated among the packed crowd at last night’s Motzoei Shabbos keynote session of the Agudah Convention. 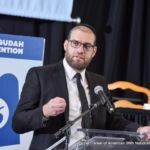 Echoing the convention’s theme – Moving Forward – this year’s convention sessions focused on identifying, and solving, the threats Klal Yisroel faces. Some of our challenges are internal – and many of those, such as Chinuch, acting as Bnei Torah in the secular work environment, and exploring difficult family situations – were addressed in Shabbos’s sessions. The Friday night and Shabbos day sessions, full because of the convention’s sold-out crowd, spoke to those with an eye towards giving participants tools for dealing with them. But other challenges facing Klal Yisroel come from the outside: The Kedushah of Eretz Yisroel is under threat. Society’s increasingly secular value system is seeping into our community. 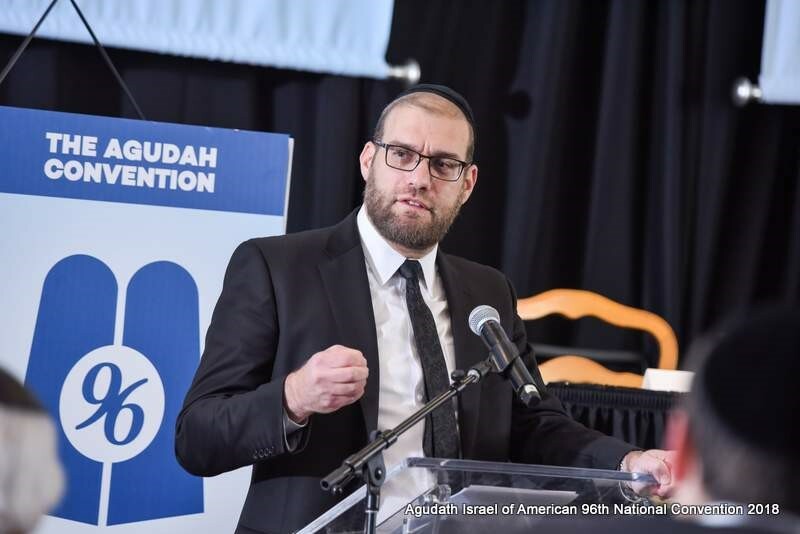 Speaking about the attacks on our Yeshiva system, Rabbi Chaim Dovid Zwiebel, Executive Vice President of Agudath Israel, said in his Motzoei Shabbos keynote address: “Government is coming into yeshivos and saying, ‘Let’s look at your curriculum, let’s look at how you spend your day.’” As in previous years, the Agudah Convention leads directly to action, and moving forward, the Agudah already has plans in place for new initiatives inspired by this year’s convention. A poignant and bittersweet moment of the Motzoei Shabbos program was a tribute to Rabbi Shlomo Gertzulin, Agudath Israel’s Executive Vice President for Finance and Administration, on his upcoming retirement. Mr. Shlomo Werdiger, Chairman of Agudath Israel’s Board of Trustees, lauded Rabbi Gertzulin, saying that he never confined himself to the traditional job description of CFO in the 38 years he served in Agudah. After enumerating a long list of Agudah activities and accomplishments Rabbi Gertzulin is credited with, Mr. Werdiger and Rabbi Zwiebel presented Rabbi Gertzulin with a letter of appreciation written and signed by the Moetzes Gedolei Hatorah. It was a beautiful and inspirational Shabbos, graced with engaging sessions including an open Q & A session from HaRav Shmuel Kamenetsky, and many others. The Agudah encourages you to tune in to the convention sessions which are available at https://www.agudahconvention.org/live. To view past sessions and for more information about the Agudah Convention, please see https://www.agudahconvention.org/.